In light of the horrible school shootings we have witnessed in Sandy Hook Elementary School, Virginia Tech, Columbine High School, and more, people and companies are trying to figure out how to fight back. In some cases, ex-Marines have decided to stand guard at their children’s schools. In others, companies are coming up with emergency protective devices as a last line of defense for teachers and school children. Hardwire Armor Systems has developed a white board that doubles as a bulletproof shield. According to USA Today (22 January 2013), the whiteboards are 18″ by 20″, a quarter inch thick, and 3.75 lbs. and have three rubberized handles on the back for slipping your arm through. The whiteboards are made of a similar ultra-strong polyethylene material used in Mine Resistant Ambush Protective (MRAP) vehicles in Iraq and Afghanistan, and they are light enough and less dense than water and will actually float. While we hope our teachers and children never need these to hold off an attacker until first responders arrive, it is good to know that they are there just in case to stop that deadly oncoming bullet. The whiteboard costs $299 and a smaller 10″ by 13″ bulletproof clipboard costs $109.To outfit a standard high school with whiteboards would cost $15,000 and for all 7 million teachers and administrators in America $1.8 billion. For anyone who has ever stayed at the Four Seasons, you know it is an incredible hotel. Customer service reins supreme and that’s not just good business, it’s good corporate values. But reading about the Indian version of the Four Seasons called the Taj–it seems like they have taken customer service to a whole new level. The Tajwhich has been operating for more than 100 years (opened in 1903) has 108 hotels in 12 countries, including of course India, but also Australia, South Africa, the United Kingdom, and even America (Boston, New York, and San Francisco). Harvard Business Review (December 2011) describes not just the routine day-to-day service provided at the Taj, but rather how they behaved under one of the most trying events, a terrorist attack. On November 26, 2008, there began a coordinated 10 attacks across India’s largest city Mumbai than killed at least 159 and gravely wounded more than 200. The attack now referred to as 26/11 (i.e. 26th of November) included the luxury hotel, the Taj Mahal Palace and Tower (i.e. the Taj Mumbai). 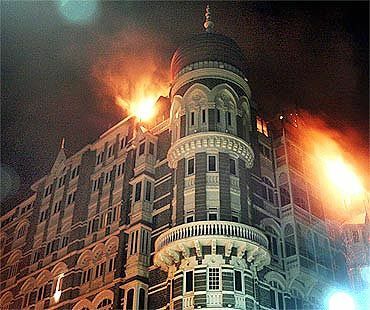 The Taj Mumbai suffered at least 6 blasts and “stayed ablaze for two days and three nights” engulfing the beautiful domes and spires of this structure. But while the hotel suffered significant damage resulting in months of rebuilding, the spirit of service by the workers at the Taj was tested to the extreme and thrived. The Taj staff did not run out screaming–everyman and woman for themselves, but they not only stayed calm and helpful, but they actually put their guests lives above their own. This is sort of reminiscent of the firefighters, police, and other emergency first responders on 9-11, who ran up the stairs on the burning World Trade Center to save people–but in this case at the Taj, these were not trained rescuers, they were hotel staff. In another instance at the hotel, according to the article, hotel employees even “form[ed] a human cordon” around the guests. This again sounds more like the Secret Service protecting the President of the United States, then waiters and waitresses serving guests. This is not to say that culture is the driving factor here, for example just this December 9, ABC News reports on how a fire broke out in an Indian hospital and killed at least 89 residents, while the “staff flees” and 6 administrators are subsequently arrested. So if national culture is not the difference in how organizations and its people treat customers–what is? HBR explains that it’s really a recipe for customer service and user-centricity. Starting with a “values-driven recruitment system” where the hotel looks for employees with character traits such as respect for elders, cheerfulness, and neediness (this reminds me of a boss I had that used to say she likes to hire employees “who are hungry.”). The values of the Taj go so far toward serving its customers, that they insist that employees actually put customer needs aheadof the company and this is reinforced with a recognition system for those who strive and act for making happy customers. Is this user-centric orientation limited to just the Taj Mumbai? Apparently not, when a Tsunami struck at 9:30 AM on December 26, 2004 and killed 185,000 people, the Taj on the Maldives Island affected “rushed to every room and escorted them [the guests] to high ground” and still managed to serve lunch to survivors by 1:00 PM. Talking about setting the bar high for customer service–how can you beat that? Great new iPhone App by the San Ramon Fire Department called FireDepartment. This life-saving iPhone app notifies citizens trained in CPR (that have opted-in) of a cardiac emergency occurring in a public area near them. The problem it addresses is that generally it takes about 7 minutes from a heart attack to death, and it can take about just as long for rescue crews to reach victims. So, if there are qualified people in the vicinity that can help in the the crucial minutes in between, they can literally save lives. 1) Emergency dispatchers receive a call for help. 2) They enter “CPR assistance needed” into the dispatch system. 3) First responders AND local citizens with the CPR app (within 500 feet of the emergency) are alerted. 4) Location-based technology in the iPhone directs you to not only where the assistance is needed but also to where the nearest automated external defibrillator (AED) can be found. Currently, the app covers San Ramon County’s 155 miles, but there are plans to make it available as open source code to other jurisdictions across the country as well. The app was developed with the help of Fire Chief Richard Price who previously was a software engineer and is bringing a new technology focus to life-saving emergency response. There are also iPhone apps that walk you through performing CPR, such as CPR-Choking and CPR Hero. Hopefully, we never need these apps, but it’s good to know people and information are there to help just an iPhone app away. This is amazing (watch the whole thing)! Meet the latest and greatest military humanoid robot from Boston Dynamics–Atlas (aka PETMAN). Watch the movement of the Atlas robot–it is JUST like a person: heel to toe walking. See what happens when you push it–Atlas reacts/recovers like a human would. The built up version has hands that help it balance and squeeze through tight spaces. BusinessWeek (March 7-13, 2011) explains that this robot will be used initially for surveillance and emergency rescue missions. I’m thinking Atlas should be pronounced like “at last” to recognize the amazing leap forward in robotics. This is great stuff–and it demonstrates our growing understanding of not only computers and robotics, but also of the physical and behavioral sciences. Obviously, I am a technology aficionado, but there is none more awesome than technology, which saves lives. So to me, defense systems (a topic for another blog) and emergency management systems are two of the most fascinating and compelling areas of technology. Recently, I have been closely following the story of the Chilean miners trapped beneath 2,200 feet of rock and earth due to a cave-in on 5 August. It took 17 days to even find the miners in the winding underground mineshaft, and since then the ongoing determination and ingenuity of the emergency rescuers has been incredible. The Wall Street Journal, 1 October 2010, in an article called “Inventions Ease the Plight of Trapped Miners” describes this unbelievable rescue effort. – The Paloma (or Pigeon)—supply pod that is “a five-foot-long hollow cylinder that works like a pneumatic tube.” Rescuers stuff it with supplies and lower about 40 of these every day through a 4 inch diameter shaft to supply the miners food, medicine, electrical supplies. – The Phoenix—rescue capsule, 10 feet tall, 900 pounds, with its own oxygen supply and communication systems designed to extract the trapped miners and bring each of them for the 15-40 minute ride it will take to get them to the safety of the surface. – Fiber Optic Communications—the miners are using a fiber-optic video camera and telephone link hooked to videoconferencing equipment. This has been cited as one of the biggest boosters of the miner’s morale. – Video Projectors—cellphones with built in projectors have been sent down to the miners allowing them to watch films and videos of family and friends. – iPods—these were considered, but rejected by the chief psychologist of the rescue effort who feared that this may isolate the miners, rather than integrate them during this emergency. – Modern Hygiene Products—Dry shampoo, soap-embedded hand towels, and self-sterilizing socks, have helped reduce odor and infection from the miners. There are some great pictures and graphics of these devices at an article in the U.K. Telegraph. What was once being targeted as a holiday rescue, by December, is now being envisioned as an October-November rescue operation. And with the continued application of innovation and technology, the miners will soon we back safe with their families and loved ones. Also, ongoing kudos to the heroic rescuers!